PERFECT MUFFIN CUPS - BRING HAPPINESS TO KIDS! - These silicone cupcake cups distribute the heat evenly and help bake more efficently. - No need a muffin tray,place your cupcake liners directly onto a baking sheet! - Oven,Microwave,Freezer and Dishwasher safe. - High quality,easy-release and non-stick baking cups are reusable,3 different kinds shapes meet your daily use! - Ideal for parties such as birthdays,baby showers,weddings,anniversaries and so on. VIBRANT COLORS BRIGHTEN YOUR LIFE,KIDS LOVE,YOU LOVE TOO. 1 package including 3 different shapes,36pcs. Choose the color you like to bake sweets and separate your bento lunch boxes! Show off your creativity with the love and cute muffin cups to tickle your family members' taste bud. Tasty mini pot pies,meat loafs,quiche,gelatin molds,cheesecakes and frozen treats such as ice cream cakes and fruit bowls are WAITING FOR US! Easy to use: Our silicone muffin cups will fit perfectly for your existing cupcake sheets or you can simply place them directly on a regular baking sheet.No need to use a muffin pan.Also convenient for microwave cooking. Easy to clean: Just need to turn inside out and use any brush,they will be in a blink of an eye.Also,they are completely dishwasher safe. Easy to store: Finishing cleaning and air dry,simply pack them into our sealed container for easy use anytime. MULTIPLE SHAPES & COLORFUL - Square,Rectangle and Round.Vibrant colors and different shapes silicone cupcake cups brighten kids' bento boxes,even picky eaters love eating healthy meals using these bright,vibrant,rainbow colors liners.Also you can make multiple shapes'cupcakes to better satisfy kids'taste bud. 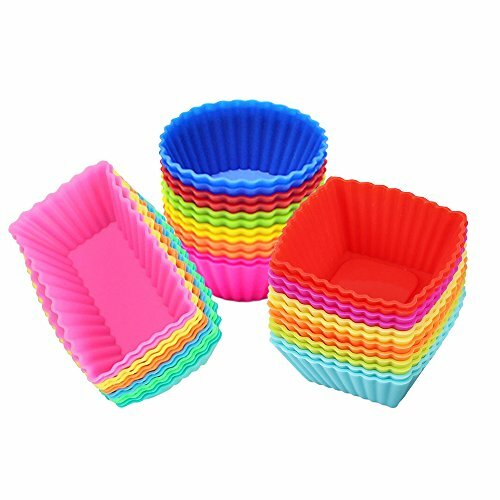 NON-STICK,EASY CLEANING - Never become a silent killer of the nature,use"Easy to Wash,Easy to Release,Non-stick "silicone muffin cups instead of messy paper liners.After baking,the cupcakes popped right out,save your money and time with our silicone muffin cups. SAFE & REUSABLE - With BPA,PVC free and eco-friendly 100% food-grade silicone,the muffins cup molds are temperature safe from -104 F to +446 F.Microwave,oven,refrigerator,freezer and dishwasher safe.More durable for your longer time use. GREAT VERSATILITY - Excellent for portion control snacks;Great time saver for family members for grab-and-go breakfasts;Baking goods like muffins,cupcakes,chocolate desserts,etc.More uses are waiting for your discovery. 100% SATISFACTION GUARANTEE: We promise 24 months warranty and a 30-day money-back guarantee. If you do not absolutely love it,we will replace them freely or refund you full order payment.Trust us,we will not let you down! Get these baking essentials by ielek Official today,and let this cupcake cups help you make your new baking a winner! If you have any questions about this product by IELEK, contact us by completing and submitting the form below. If you are looking for a specif part number, please include it with your message.